I visited the Hartford Courant as a high school student. It was the first time I was in a newsroom. The Connecticut paper’s newsroom, the size of a city block, was packed with rows of metal desks, most piled high with newspapers and notebooks. Reporters banged furiously on heavy typewriters set amid tangled phone cords, overflowing ashtrays, dirty coffee mugs and stacks of paper, many of which were in sloping piles on the floor. The din and clamor, the incessantly ringing phones, the haze of cigarette and cigar smoke that lay over the feverish hive, the hoarse shouts, the bustle and movement of reporters, most in disheveled coats and ties, made it seem an exotic, living organism. I was infatuated. I dreamed of entering this fraternity, which I eventually did, for more than two decades writing for The Dallas Morning News, The Washington Post, The Christian Science Monitor and, finally, The New York Times, where I spent most of my career as a foreign correspondent. 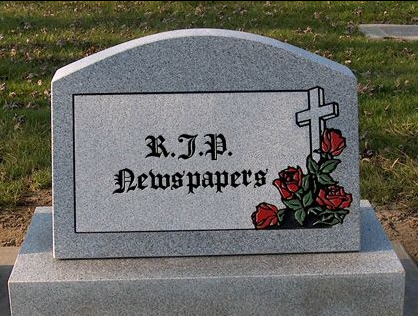 The great newspapers sustained legendary reporters such as I.F. Stone, Murray Kempton and Homer Bigart who wrote stories that brought down embezzlers, cheats, crooks and liars, who covered wars and conflicts, who told us about famines in Africa and the peculiarities of the French or what it was like to be poor and forgotten in our urban slums or AppalachiaThese presses churned out raw lists of data, from sports scores to stock prices. Newspapers took us into parts of the city or the world we would never otherwise have seen or visited. Reporters and critics reviewed movies, books, dance, theater and music and covered sporting events. Newspapers printed the text of presidential addresses, sent reporters to chronicle the inner workings of City Hall and followed the courts and the police. Photographers and reporters raced to cover the lurid and the macabre, from Mafia hits to crimes of passion. Sydney Schanberg was nearly killed in Cambodia in 1975 after staying there for The New York Times to cover the conquest of Phnom Penh by the Khmer Rouge, reporting for which he won a Pulitzer Prize. Later he went back to New York from Cambodia and ran the city desk. He pushed reporters to report about the homeless, the poor and the victims of developers who were forcing families out of their rent-controlled apartments. But it was not a good time to give a voice to the weak and the poor. The social movements built around the opposition to the Vietnam War had dissolved. Alternative publications, including the magazine Ramparts, which through a series of exposés had embarrassed the established media organizations into doing real reporting, had gone out of business. The commercial press had, once again, become lethargic. It had less and less incentive to challenge the power elite. Many editors viewed Schanberg’s concerns as relics of a dead era. He was removed as city editor and assigned to write a column about New York. He used the column, however, to again decry the abuse of the powerful, especially developers. The then-editor of the paper, Abe Rosenthal, began to acidly refer to Schanberg as the resident “Commie” and address him as “St. Francis.” Rosenthal, who met William F. Buckley almost weekly for lunch along with the paper’s publisher, Arthur “Punch” Sulzberger, grew increasingly impatient with Schanberg, who was challenging the activities of their powerful friends. Schanberg became a pariah. He was not invited to the paper’s table at two consecutive Inner Circle dinners held for New York reporters. The senior editors and the publisher did not attend the previews for the film “The Killing Fields,” based on Schanberg’s experience in Cambodia. His days at the newspaper were numbered. The city Schanberg profiled in his column did not look like the glossy ads in Rosenthal’s new lifestyle sections or the Sunday New York Times magazine. Schanberg’s city was one in which thousands of citizens were sleeping on the streets. It was one where there were lines at soup kitchens. It was a city where the mentally ill were thrown onto heating grates or into jails like human refuse. He wrote of people who were unable to afford housing. He lost his column and left the paper to work for New York Newsday and later The Village Voice. The leaders of the civil rights movement grasped from the start that without a press willing to attend their marches and report fairly from their communities on the injustices they decried and the repression they suffered, the movement would “have been a bird without wings,” as civil rights leader and U.S. Rep. John Lewis said.